Students from the University of Florida (UF) and Santa Fe College (SFC) Baptist Collegiate Ministries (BCM) recently joined with several other evangelical campus ministries, local churches, and a team of apologists from Ravi Zacharias Ministries (RZIM) to present a series of evangelistic talks themed Hungry, at their schools from Jan. 29th to Feb. 1st. After gathering for prayer, devotion, and praise each morning, the team dispersed around campus to hand out flyers inviting students to lunch time talks. In addition, white boards were scattered around the schools with polls designed to engage students in discussion as well as large chalk boards with a similar purpose. Attendance for the lunch talks were standing room only with approximately 125 students present for each of the twice daily talks at UF and around 50 for the ones at SFC. Free lunches helped attract literally hungry students at both schools. The lectures presented by RZIM staff members were followed by questions and answers sessions and after the sessions, many of the students spent time with staff and members of the local groups. The evening sessions were held at the BCM building with attendance at near capacity most nights. There were three students with direct ties to the BCM that made professions of faith during the week and at least 13 more professions from other students. There were amazing stories of how the Lord had been using multiple friendships among believers from different groups to bring lost students to Himself throughout the week. 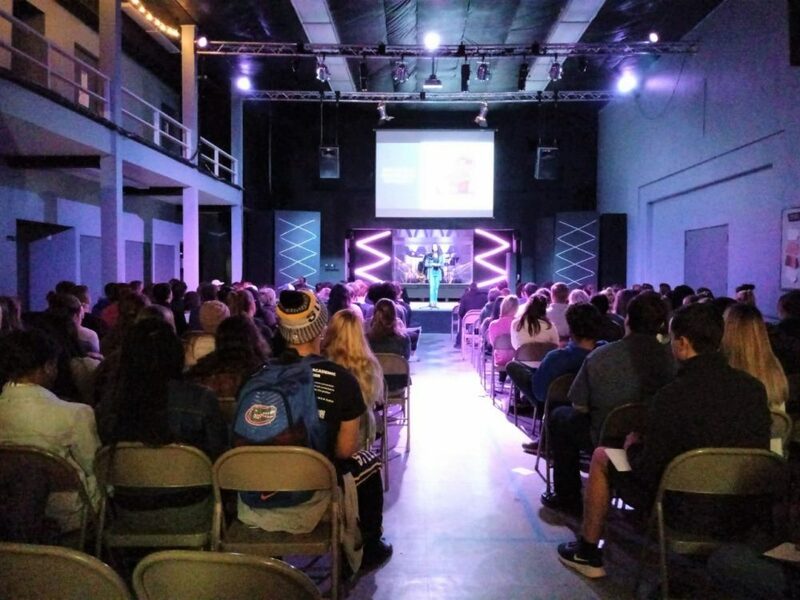 Students who were already believers were able to gain valuable training in how to share the Gospel with their friends and have significant conversations about the deeper issues that face students today. They were encouraged to be bold in their witness, consistent in their invitation of their friends, and confident that their faith in Jesus is both rational and relevant.